The International Tea Sippers Society presents a righteous idea that I am happy to share with you. Sip for Peace! Now that’s an idea worth passing on! O.K. They have our attention but what do they mean? Here’s what it means – All during January the organizers of the “Sip for Peace” campaign ask tea lovers everywhere to hold “Sip-Ins” for world peace. The simple practice of taking tea, whether by yourself or with a group of sweet friends, is the perfect environment to inspire thoughts of a more peaceful way of life. The tea community is an interesting network to tap into for this purpose because it’s already built upon respect for other cultures. All over the world tea represents hospitality, comfort, and even peace. Interested to learn more? 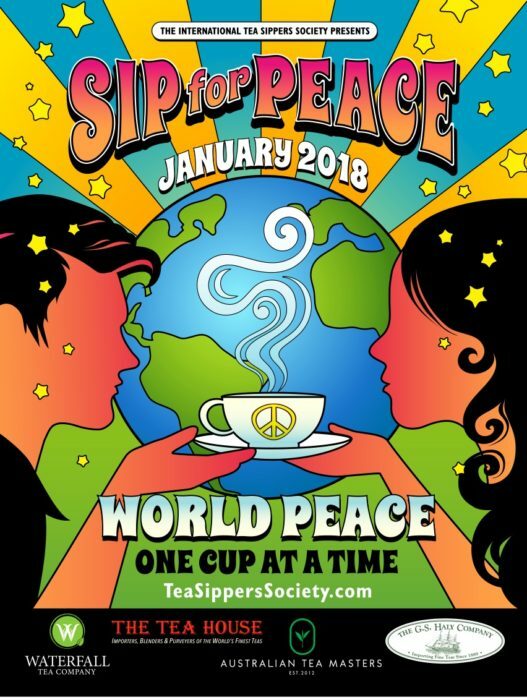 Go to https://teasipperssociety.com/project/sip-peace-2018/. The tea party idea is my favorite part! I think this is a lovely reason to get together with some friends this month. Let me know if you host your own Sip-In for Peace!